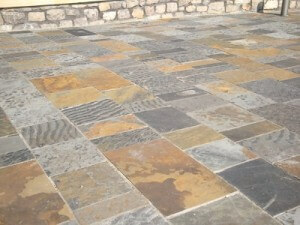 Flagstone when used on floors, patios, walkways and foyers always looks exceptional. Blue Pennant patterned stone has a formal, yet rustic appearance, which is great for creating that special touch. Gwrhyd Pennant fine grained riven sandstone varies from light blue/grey through to brown/rust colors. Gwrhyd Pennant stone is quarried from the Rhondda Beds of the Pennant series of Carboniferous Sandstones. Riven paving has a naturally rough surface because it is hand split, or ‘riven’, from large flagstone paving slabs. The blocks are formed in sedimentary layers called strata or beds which allows the stone to be split with hand tools. For stone sales please visit our quarried stone products page. 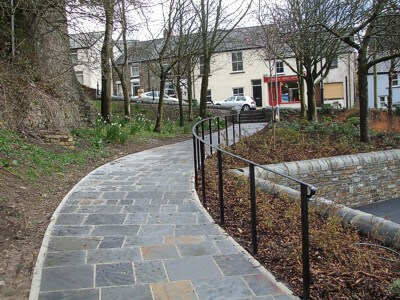 For information about Flagstones please check out Flagstone Information page.